People digest information in different ways. Some prefer things strictly in writing, while others prefer a more visual demonstration—color-coded files, pie charts, and the like. 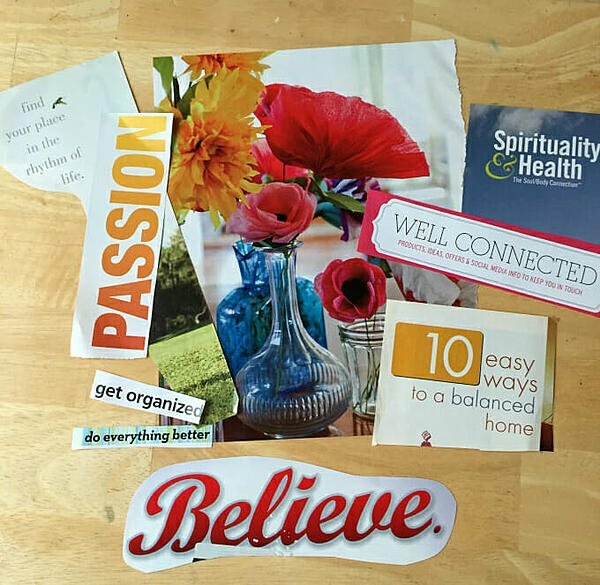 If you’re more of the artistic inclination, you’re probably intrigued by the idea of making a vision board. A vision board is a visual representation of who you want to be and what you want to accomplish. It’s a collection of images and text, pasted onto a board (or placed in a frame, or created in Photoshop—there are no rules), and displayed prominently so you see it every day. The purpose of a vision board is to get you in the right mindset. It forces you to think about your goals—and your Why—every single day, which can be incredibly powerful. 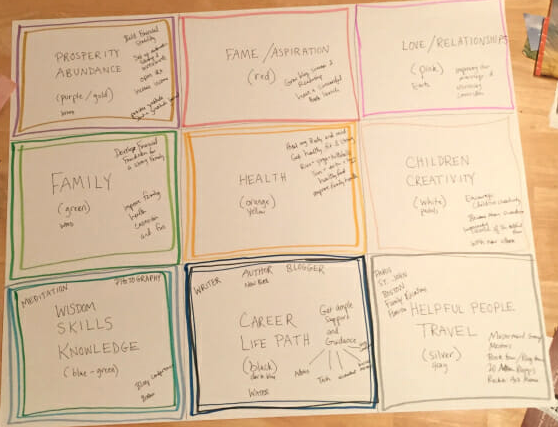 As part of the annual goal-setting process, vision boards can help agents and teams set and prioritize goals, values, and intentions—and plant these ideas firmly in their minds. And your vision board doesn’t have to be limited to your business goals. You can represent goals for every aspect of your life: health, personal development, relationships, etc. It sure does—if you do it right! The key to making a vision board work is backing it up with a strong process—a well-thought-out series of action items that you will accomplish each quarter, month, week, and day. 1. Set goals and prioritize. First, sit down with paper and pen and think about your goals for the coming year. Start with a big brain dump—this can include the big goals (get healthy and strong, learn how to meditate, take the family on a trip to St. John), as well as the little wish-list type of stuff (get a new vacuum cleaner), intentions (be more mindful, be better at connecting with my family), and words for the year (clarity, joy, peace). After the first brain dump, review your thoughts and notes, figure out what the priorities are, and either circle them or create a new list. What are the things you want to happen above all else? Those are definitely going on your vision board. A lot of the other things will end up on your board, too, but you want to make sure the biggies get their place. 2. 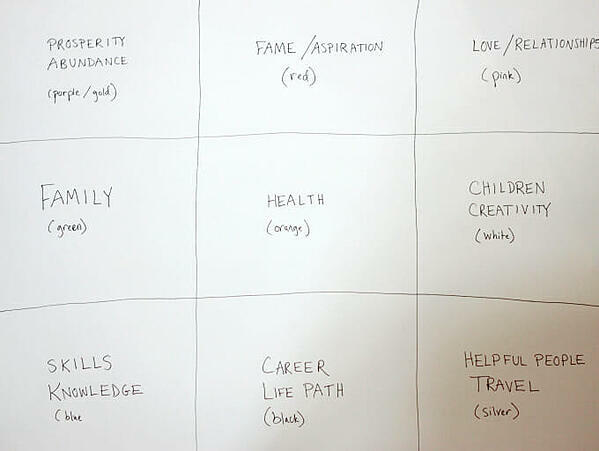 Create a basic structure for your vision board. Decide how you will categorize your vision board. You can break it down into just two sections—Business and Personal Life—or go into more detail (see the example below, which features 9 different sections). However many categories you decide to have, block them out on your poster board, and title and color-code each one. Start writing your goals and intentions for each life area directly on the poster board. Don’t worry about how messy it looks—it will get covered over later with collage images. This part helps you round out your goals. For example if your initial brain dump focused on finances and health (e.g., more transactions and improving your mile time for a 5K run), you’re now reminded to consider relationships, skills, etc. 4. Find images and words for the vision board. This is the fun part! Search for and cut out images and words that embody your goals and/or just speak to you. When we asked Treasure Davis about her process, she told us she goes through a stack of magazines (generally from the free stack at the public library or bought for a quarter each from Goodwill) and clips everything she likes—colors, words, interesting images—but she also goes on the hunt for images and words that relate to her and her team’s goals. If you can’t find a particular image you want in a magazine, just hope on the computer and do an image search. You could do this as you go or after the cutting spree. So, with your poster board in front of you, and your pile of images at hand, go through the images and decide what belongs on the poster board and place it in the section it will go (but don’t paste it down yet). Then continue through the pile of clippings. Some images will go on the poster board, some will go in a “later” pile to be used in a future collage, and some will just be recycled. 6. Finalize images and placement. Now it’s time to select the final images and words that you’ll use, trim and refine the edges, and get everything laid out on your board. If you plan to add your own words or doodles, leave space for those. 7. Glue down your images. When everything is arranged to your satisfaction, it’s time to glue! 8. Add your own words, doodles, or sketches. Whether it’s a quote that motivates you, a milestone date you’re working toward, or a sketched logo of the business you dream of starting, go for it! It’s your vision board and you can doodle if you want to. 9. Display your vision & review it every day. Hang it on the wall in your office in a spot where you’ll see it every day, and let it serve as a reminder of what you plan to accomplish this year. You might also want to take a photo of it and set it as the lock screen wallpaper on your phone—then it will be with you everywhere you go. So what do you say? If you’re feeling artistic and looking for a fun way to get your mind right for 2019, take a few hours one afternoon to create a vision board. It just might be the little kickstart you need to make 2019 your best year yet.